The core Zulip application is at https://github.com/zulip/zulip and is a web application written in Python 3.x and using the Django framework. That codebase includes server-side code and the web client, as well as Python API bindings and most of our integrations with other services and applications (see the directory structure guide). We also maintain several separate repositories for integrations and other glue code: a Hubot adapter; integrations with Phabricator, Jenkins, Puppet, Redmine, and Trello; node.js API bindings; and our full-text search PostgreSQL extension. We use Transifex to do translations. In this overview, we’ll mainly discuss the core Zulip server and web application. Zulip is a real-time web-based chat application meant for companies and similar groups ranging in size from a small team to more than a thousand users. It features real-time notifications, message persistence and search, public group conversations (streams), private streams, private one-on-one and group conversations, inline image previews, team presence/buddy lists, a rich API, Markdown message support, and numerous integrations with other services. The maintainer team aims to support users who connect to Zulip using dedicated iOS, Android, Linux, Windows, and macOS clients, as well as people using modern web browsers or dedicated Zulip API clients. A server can host multiple Zulip realms (organizations) at the same domain, each of which is a private chamber with its own users, streams, customizations, and so on. This means that one person might be a user of multiple Zulip realms. The administrators of a realm can choose whether to allow anyone to register an account and join, or only allow people who have been invited, or restrict registrations to members of particular groups (using email domain names or corporate single-sign-on login for verification). For more on security considerations, see the security model section. The Zulip “All messages” screen is like a chronologically ordered inbox; it displays messages, starting at the oldest message that the user hasn’t viewed yet (for more on that logic, see the guide to the pointer and unread counts). The “All messages” screen displays the most recent messages in all the streams a user has joined (except for the streams they’ve muted), as well as private messages from other users, in strict chronological order. A user can narrow to view only the messages in a single stream, and can further narrow to focus on a topic (thread) within that stream. Each narrow has its own URL. The user can quickly see what conversation they’re in – the stream and topic, or the names of the user(s) they’re private messaging with – using the recipient bar displayed atop each conversation. Zulip’s philosophy is to provide sensible defaults but give the user fine-grained control over their incoming information flow; a user can mute topics and streams, and can make fine-grained choices to reduce real-time notifications they find irrelevant. Zulip is primarily implemented in the Django Python web framework. We also make use of Tornado for the real-time push system. Django is the main web application server; Tornado runs the server-to-client real-time push system. The app servers are configured by the Supervisor configuration (which explains how to start the server processes; see “Supervisor” below) and the nginx configuration (which explains which HTTP requests get sent to which app server). Tornado is an asynchronous server and is meant specifically to hold open tens of thousands of long-lived (long-polling or websocket) connections – that is to say, routes that maintain a persistent connection from every running client. For this reason, it’s responsible for event (message) delivery, but not much else. We try to avoid any blocking calls in Tornado because we don’t want to delay delivery to thousands of other connections (as this would make Zulip very much not real-time). For instance, we avoid doing cache or database queries inside the Tornado code paths, since those blocking requests carry a very high performance penalty for a single-threaded, asynchronous server system. (In principle, we could do non-blocking requests to those services, but the Django-based database libraries we use in most of our codebase using don’t support that, and in any case, our architecture doesn’t require Tornado to do that). The parts that are activated relatively rarely (e.g. when people type or click on something) are processed by the Django application server. One exception to this is that Zulip uses websockets through Tornado to minimize latency on the code path for sending messages. There is detailed documentation on the real-time push and event queue system; most of the code is in zerver/tornado. For more details on the frontend, see our documentation on translation, templates, directory structure, and the static asset pipeline. nginx is the front-end web server to all Zulip traffic; it serves static assets and proxies to Django and Tornado. It handles HTTP requests according to the rules laid down in the many config files found in zulip/puppet/zulip/files/nginx/. zulip/puppet/zulip/files/nginx/zulip-include-frontend/app is the most important of these files. It explains what happens when requests come in from outside. In production, all requests to URLs beginning with /static/ are served from the corresponding files in /home/zulip/prod-static/, and the production build process (tools/build-release-tarball) compiles, minifies, and installs the static assets into the prod-static/ tree form. In development, files are served directly from /static/ in the git repository. Requests to /json/events, /api/v1/events, and /sockjs are sent to the Tornado server. These are requests to the real-time push system, because the user’s web browser sets up a long-lived TCP connection with Tornado to serve as a channel for push notifications. nginx gets the hostname for the Tornado server via puppet/zulip/files/nginx/zulip-include-frontend/upstreams. Requests to all other paths are sent to the Django app via the UNIX socket unix:/home/zulip/deployments/uwsgi-socket (defined in puppet/zulip/files/nginx/zulip-include-frontend/upstreams). We use zproject/wsgi.py to implement uWSGI here (see django.core.wsgi). By default (i.e. if LOCAL_UPLOADS_DIR is set), nginx will serve user-uploaded content like avatars, custom emoji, and uploaded files. However, one can configure Zulip to store these in a cloud storage service like Amazon S3 instead. We use supervisord to start server processes, restart them automatically if they crash, and direct logging. The config file is zulip/puppet/zulip/templates/supervisor/zulip.conf.template.erb. 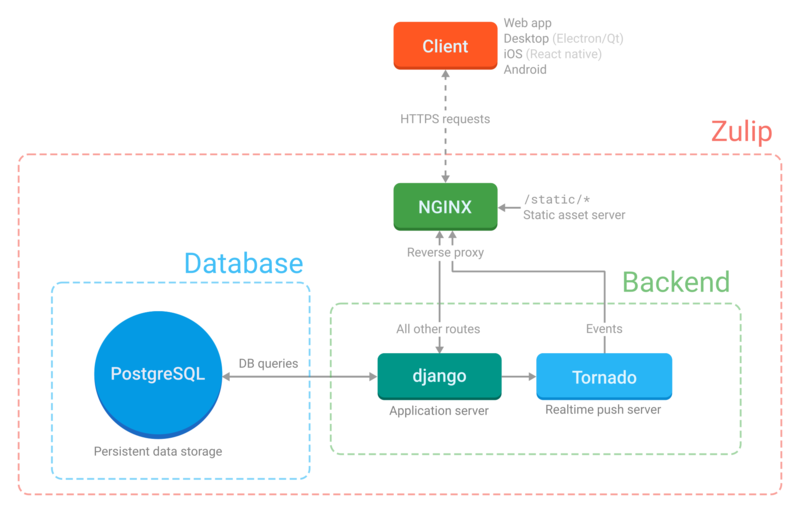 This is where Tornado and Django are set up, as well as a number of background processes that process event queues. We use event queues for the kinds of tasks that are best run in the background because they are expensive (in terms of performance) and don’t have to be synchronous — e.g., sending emails or updating analytics. Also see the queuing guide. memcached is used to cache database model objects. zerver/lib/cache.py and zerver/lib/cache_helpers.py manage putting things into memcached, and invalidating the cache when values change. The memcached configuration is in puppet/zulip/files/memcached.conf. See our caching guide to learn how this works in detail. Redis is used for a few very short-term data stores, such as in the basis of zerver/lib/rate_limiter.py, a per-user rate limiting scheme example), and the email-to-Zulip integration. # Zulip-specific configuration: disable saving to disk. People often wonder if we could replace memcached with redis (or replace RabbitMQ with redis, with some loss of functionality). Our cache uses significant memory, but that memory usage would be essentially the same with redis as it is with memcached. All of these services have low minimum memory requirements, and in fact our applications for redis and RabbitMQ do not use significant memory even at scale. We would likely need to run multiple redis services (with different configurations) in order to ensure the pure LRU use case (memcached) doesn’t push out data that we want to persist until expiry (redis-based rate limiting) or until consumed (RabbitMQ-based queuing of deferred work). RabbitMQ is a queueing system. Its config files live in zulip/puppet/zulip/files/rabbitmq. Initial configuration happens in zulip/scripts/setup/configure-rabbitmq. We use RabbitMQ for queuing expensive work (e.g. sending emails triggered by a message, push notifications, some analytics, etc.) that require reliable delivery but which we don’t want to do on the main thread. It’s also used for communication between the application server and the Tornado push system. Two simple wrappers around pika (the Python RabbitMQ client) are in zulip/zerver/lib/queue.py. There’s an asynchronous client for use in Tornado and a more general client for use elsewhere. Most of the processes started by Supervisor are queue processors that continually pull things out of a RabbitMQ queue and handle them; they are defined in zerver/worker/queue_processors.py. Also see the queuing guide. PostgreSQL (also known as Postgres) is the database that stores all persistent data, that is, data that’s expected to live beyond a user’s current session. In production, Postgres is installed with a default configuration. The directory that would contain configuration files (puppet/zulip/files/postgresql) has only a utility script and a custom list of stopwords used by a Postgresql extension. In a development environment, configuration of that postgresql extension is handled by tools/postgres-init-dev-db (invoked by tools/provision). That file also manages setting up the development postgresql user. tools/provision also invokes tools/do-destroy-rebuild-database to create the actual database with its schema. We use Thumbor, a popular open source thumbnailing server, to serve images (both for inline URL previews and serving uploaded image files). See our thumbnailing docs for more details on how this works. Nagios is an optional component used for notifications to the system administrator, e.g., in case of outages. zulip/puppet/zulip/manifests/nagios.pp installs Nagios plugins from puppet/zulip/files/nagios_plugins/. This component is intended to install Nagios plugins intended to be run on a Nagios server; most of the Zulip Nagios plugins are intended to be run on the Zulip servers themselves, and are included with the relevant component of the Zulip server (e.g. puppet/zulip/manifests/postgres_common.pp installs a few under /usr/lib/nagios/plugins/zulip_postgres_common). This section gives names for some of the elements in the Zulip UI used in Zulip development conversations. Contributions to extend this list are welcome! chevron: A small downward-facing arrow next to a message’s timestamp, offering contextual options, e.g., “Reply”, “Mute [this topic]”, or “Link to this conversation”. To avoid visual clutter, the chevron only appears in the web UI upon hover. huddle: What the codebase calls a “group private message”. message editing: If the realm admin allows it, then after a user posts a message, the user has a few minutes to click “Edit” and change the content of their message. If they do, Zulip adds a marker such as “(EDITED)” at the top of the message, visible to anyone who can see the message. realm: What the codebase calls an “organization” in the UI. recipient bar: A visual indication of the context of a message or group of messages, displaying the stream and topic or private message recipient list, at the top of a group of messages. A typical 1-line message to a new recipient shows to the user as three lines of content: first the recipient bar, second the sender’s name and avatar alongside the timestamp (and, on hover, the star and the chevron), and third the message content. The recipient bar is or contains hyperlinks to help the user narrow. star: Zulip allows a user to mark any message they can see, public or private, as “starred”. A user can easily access messages they’ve starred through the “Starred messages” link in the left sidebar, or use “is:starred” as a narrow or a search constraint. Whether a user has or has not starred a particular message is private; other users and realm admins don’t know whether a message has been starred, or by whom. subject: What the codebase calls a “topic” in many places. bankruptcy: When a user has been off Zulip for several days and has hundreds of unread messages, they are prompted for whether they want to mark all their unread messages as read. This is called “declaring bankruptcy” (in reference to the concept in finance).